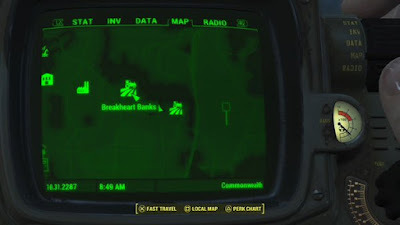 - Breakheart Banks is located in the northeast of the Commonwealth, a short trip to the west of The Slog. You’re most likely to encounter it when travelling east for the Out of the Fire quest, though if you head to The Slog they may ask you to clean out this area as a condition for becoming a controllable settlement. Be careful in the area around the waterfront location - there’s a road running south of Breakheart Banks with a small pileup of military vehicles, and it’s guarded by an Assaultron and a Mister Gutsy. Nothing to sniff at for a lower-level player. Because the area is surrounded by rocks and uneven terrain, stealth works quite fabulously here. Sneak in, take out the Super Mutant in the smaller, eastern guard post, then work your way down. Alternatively, make your way along the river just to the north of the farm, then climb the wooden steps you see up to the rear of the property. This is a good approach if you want to Sneak Attack with melee weapons. Even if you don’t opt for stealth, stay at a distance most of the time. The Super Mutant Butcher is quite powerful with his rifle, and can whittle down your health rather quickly if you move too close. At a greater distance he’s more likely to miss. This will also give you more room to deal with the melee combatants before they can close in. Speaking of the melee dudes, try to get high. Again, the area around the guard post works well for this, as it’s nicely elevated and will give you excellent places to shoot anyone trying to charge you down. Last, most important, don’t approach from the road. The front gate is just about the worst way to enter the property. You'll be attacked by everyone at once.